Where/when did the convention originate of marking pullback (and/or pushout) squares by that little right-angle symbol in the corner? The earliest instance I’ve been able to find is in Paul Taylor’s diagrams package, from ≤1994, as mentioned in e.g. the changelog notes for v3.81 at http://www.paultaylor.eu/diagrams/ . But it seems more likely that this was to meet the demand for a notation that was already established, rather than being the origin? But looking at various well-known category theory textbooks from before 2000 (Mac Lane Categories for the Working Mathematician; Mac Lane and Moerdijk Sheaves in Geometry and Logic; Borceux Handbook of Categorical Algebra; Johnstone Topos Theory), none of them seem to use it, as far as I can find. So, I was not surprised to see Paul Taylor's notation. And for me, too, it was the first time I noticed a notation similar to the one it was used here in print. later, the main research areas where closed categories and homology theories, though after all these years, it has diversified a lot. Not the answer you're looking for? Browse other questions tagged ct.category-theory ho.history-overview notation pullback or ask your own question. 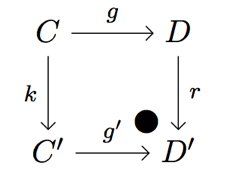 Is continuity of a functor stable under pullback? 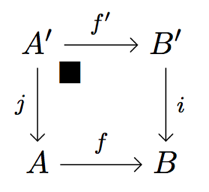 When was the “arrow notation” for functions first introduced?